The Tallahassee housing market is undergoing the greatest change that I have seen in my twenty plus years as a real estate agent in Tallahassee. Values are declining and buyer activity is declining, leaving the real estate market in a state of uncertainty. 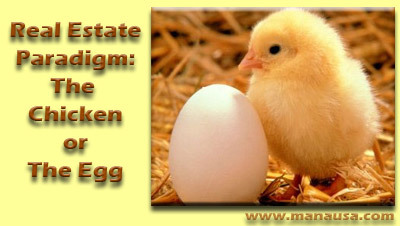 As with much of the rest of the US housing markets, Tallahassee has a "chicken or the egg" problem. Those of us who have a great interest in the state of the housing market are faced with something similar to the age-old question of what came first, the chicken or the egg. In real estate, the question is "what will come first, the buyer or the seller?" Roughly 2/3rds of the homebuyers in Tallahassee have traditionally needed to sell a home before they could buy. In a market where roughly 60% of homeowners have either no equity or actually have negative equity, they are trapped in their current homes and cannot sell without first having to raise some money. This large pool of "trapped" homeowners represents the normal group of people that we look to buy a home, so the big problem in real estate is how are we going to get people out of their current homes so that they can buy their next home. And this is not a local problem. Homeowners across the US are faced with this same problem, so as they desire to move from one market to another, they first have a home to sell. As values continue to slide, the problem is only worsening, and thus our paradigm ... what will come first, the home seller or the homebuyer? The real estate graph above shows two very important trends that Tallahassee homeowners need to understand. First of all, we are seeing home prices continue to fall, but secondly, we are seeing price range ratios return to normal Tallahassee standards. In 2002, 82% of home sales were at a price of $200,000 or less. But with the boom of the housing market spurred by the cheap and easy supply of mortgage money, we saw that change so drastically that by 2006, only 58% of the homes sold were under $200K. Currently, about 71% of the homes are selling below $200K, and I see the market returning to a point where Tallahassee is going to have a very limited (but normal) need for the more expensive homes. Currently, less than one half of one percent of home sales are at a price exceeding $750K, and only 12% of the homes sold this year are above $300K. In 2002, that number was at 1% (meaning only 1% of homes sold in 2002 were at a price above $300K), and we are seeing a return to these more traditional prices. High end homes will begin to fall in price at an even more rapid pace due to this market correction. When we look at a real estate graph of home sales by size range, we get a picture that unsurprisingly parallels what we saw from the price range graph. Large luxury homes are seeing their numbers decline at a greater rate than the 1,000 to 2,000 square foot homes. Also note that homes under 600 square feet (mostly condominiums) have all but fallen off of the graph. I believe this is a sign that what few buyers there are in the housing market are seeking the traditional Tallahassee home, and with the great values out there, they are finding really good deals for homes under 2,000 square feet. My bet is on the egg right now. I think homebuyers, through the growth of population, will lead the way in the housing market recovery. This method sadly takes time, so people who do not have a very strong need to move will be staying put in their homes, and we will watch values continue to slide until the market is able to correct the imbalance between supply and demand. For home sellers, that means either plan to stay in your homes for the 5+ years this will take, or decide to sell your home as fast as possible to get top dollar. The middle-ground of "testing the market" is a fools game and will guarantee that you do not get the best price for your home.